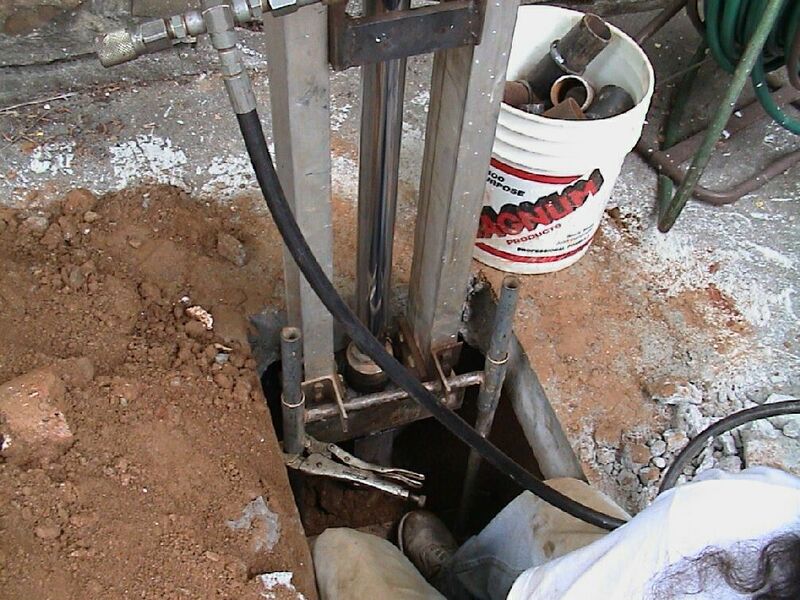 Sinking concrete can be a danger in any situation, but when the sinking concrete is in a home or building’s foundation, the situation can be dire. Concrete that is sinking is typically due to it being installed on poorly compacted fill dirt. Slabjacking is a method of filling the spaces beneath existing concrete to raise the foundation level back to where it needs to be. Anglin’s Foundation & Masonry Repairs offers slabjacking services to residential and commercial dwellings in order to stabilize sinking concrete building slabs. Slabjacking is done by experienced masons who begin by drilling a pattern of holes small holes into the sunken slab. A grout mixture is then pumped under low pressure (around 10 PSI) under the slab using a hose that fits into the drilled holes. Once the voids are filled under the slab, the grout becomes pressurized, hydraulically raising the concrete slab to the desired height. The grout used is typically comprised of water, Portland cement, Bentonite or flyash, and sand. Additives are also used in order to prevent shrinkage. Any shrinkage would compromise the stability of the stabilized concrete and would put the slab right back in the same sinking situation. At Anglin’s Foundation & Masonry Repairs, we are committed to providing our customers with the most professional services available. We have the staff, equipment, systems and manpower to accomplish any job. Our dedication to providing our customers with perfection has been evident since we started back in 1930. We promise what we do, and we do what we promise. If you are in need of masonry repairs, call Anglin’s Foundation & Masonry Repairs today. We have the solution to your structural foundation problems.